Though the MacBook Pro is shown in clamshell mode, Bob will often have the display open to function as a second monitor, an especially nice prospect given the gorgeous Retina display. For those wondering, it looks like the camera used to take this great desk shot and accurately capture the lighting is a Canon EOS Digital Rebel XSi (found via EXIF data! ), presumably that’s the camera that gets most use for photography as well. 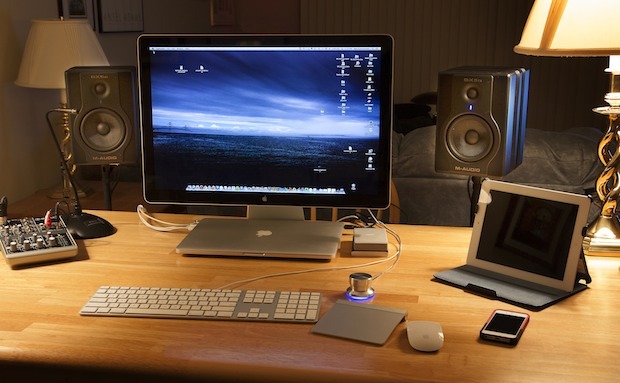 Do you have a Mac or Apple setup you want featured in our weekly setup highlight? Send submissions to us via email at osxdailycom@gmail.com, or you can post it on our Facebook page, send it to us there, or over on Google Plus. Please include a good picture or two, a list of hardware, and a brief description of what you use the gear for. Great shot. By any chance do you have a link to that wallpaper? We do not, but we’ll post it if we get it! I took the photo myself, of the Mackinaw Bridge that connects the Lower peninsula of Michigan to the upper peninsula. It does make a good wallpaper because I modified by darkening it and reducing the contrast. You are free to use it for non-commercial uses, see my photos at http://www.flickr.com/photos/bobcatbobcat/4825429977/in/set-72157626109827545. I agree. The desk is beautiful and has great working space. Any information regarding manufacturer or where to purchase this desk would be greatly appreciated. printer/scanner or printers which usually mess up most setups. The desk was actually sold as a dining room table, not a desk. It looks nice, is simple, was pretty cheap (7 years ago) but I had to add some ‘enhancments’ over the years to make it better suited as a computer desk. I have two of them to make an “L” shaped desk. What is that chrome knob, I’m sure it’s for audio, can you post what brand it is? The aluminum knob is a Griffin Powermate USB media controller, it’s in the list of equipment. It’s programmable to be a lot of things but you’re right, I use it for a volume control with push to mute. The click while dragging thing is hard for me to do on the Trackpad. And gestures are hard for me to do on the Magic Mouse. It’s just my preference.